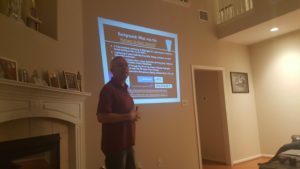 The March NSS North Houston Space Society meeting covered the Humans to Mars conference, several members shared their ZERO-G Experience® (two from this past weekend, and one from the first flight in 2004. 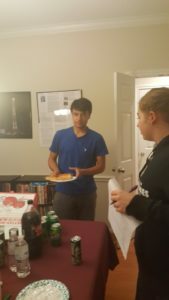 There was much discussion before and after the presentation about the Falcon Heavy Launch, Sabre Rocket engines, the idea of shooting a nanosat out of a tube, and much more. The replay of the Falcon Heavy Launch was playing on a TV. The Falcon Heavy Launch continues to make me believe that we are really on the cusp of opening up the rest of the solar system. We have felt that we were on the cusp of this for the past 50 years. But with the private development, it feels more real than ever before. 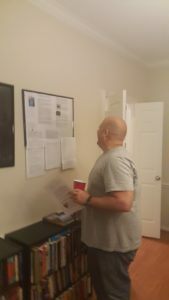 Gary Stephenson spoke about his visit to the first Humans to Mars summit back in 2013. And we discussed what has changed since then. And what we have to look forward to. Gary Stephenson is a Lead Systems Engineer at United Technologies Aerospace Systems (UTAS) providing systems engineering support for EVA Mobility Unit (EMU) on ESOC program, spacesuit upgrades, new spacesuit product development, and other life support systems development (ECLSS) for NASA, NASA prime contractors, and commercial customers. Duties include certification of spaceflight hardware, including airlock equipment such as UIAs, FPUs, and IEUs (umbilicals). The Humans to Mars Summit (H2M) is the most comprehensive Mars exploration conference to address the major technical, scientific, and policy challenges of getting humans to Mars, as well as how such missions can have positive impacts on STEM education, American competitiveness and other important collateral issues. This conference serves as the authoritative and diverse Mars exploration event, involving leading technical and policy experts from NASA, industry, the science community, and academia. There is now a clear consensus among NASA, the aerospace industry and policymakers that a human mission to Mars by the 2030s is not just feasible, but achievable as well, once the proper measures are taken. 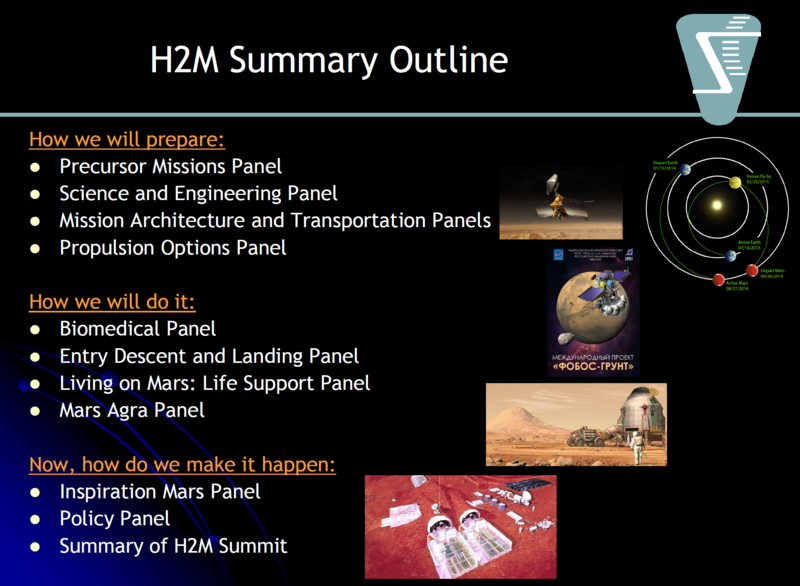 H2M is an important part of Explore Mars’s ongoing programming to help advance policy and excite the public regarding human Mars missions. 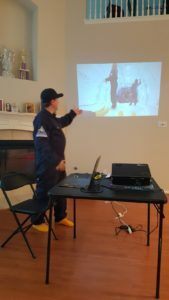 http://www.ExploreMars.org May 8-10, 2018 – George Washington University, Washington D.C.
Nathan & Christopher shared a little of their ZERO-G Experience® last weekend out of Houston Hobby. 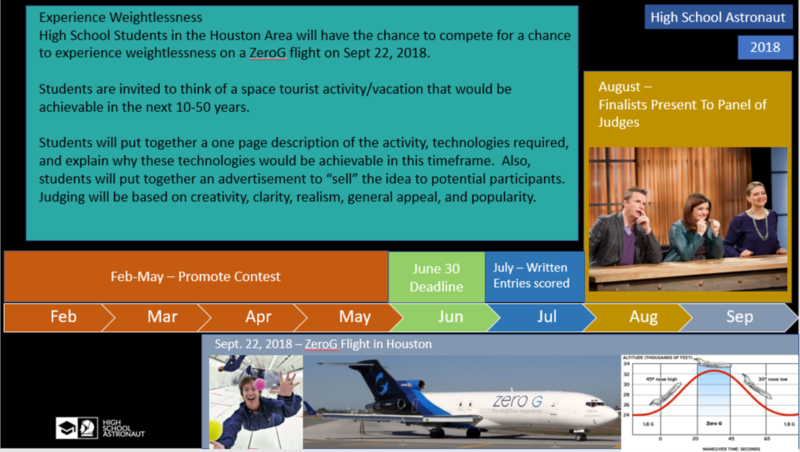 ZERO-G will be returning to Houston on September 22, 2018. 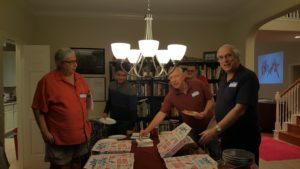 We had a great February meeting where we had a number of new people attend. 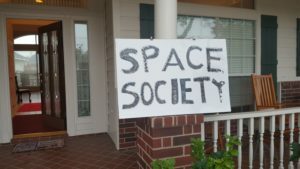 The focus was on Space Tourism – Private citizens paying to go to space. The Economist predicts that 2018 will be a transformational year for Space Tourism. There are seven people that have paid to travel to the International Space Station, all facilitated by Space Adventures. How many private citizens have gone to the international space station? Who was the last one? Which ones live in Texas? How many were men? 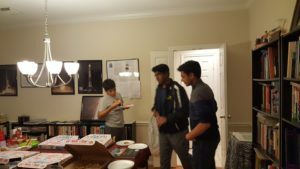 How many women? There was a description of each space tourist around the meeting area to help answer these questions. We also discussed how Space for Humanity (http://www.SpaceForHumanity.org) is offering the opportunity for 18+ every-day citizens to go on such flights. 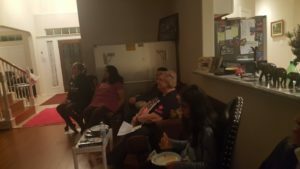 The NSS North Houston Space Society had our first meeting January 6, 2018 night. 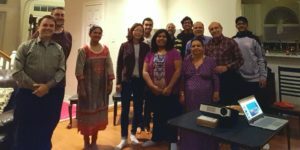 Sixteen people attended. 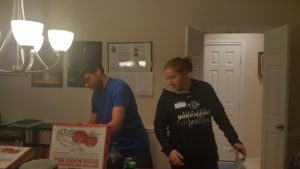 We started out with a mixer activity. 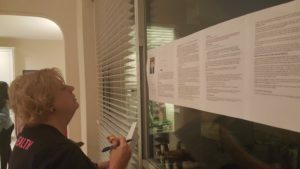 Each participant was handed a stack of cards containing one of the 12 moonwalkers. Each person had to trade with others until they got a complete set. 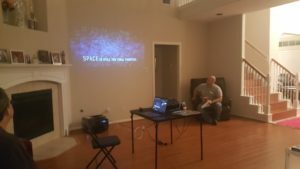 We reviewed a presentation about 2017 space events and the things to look forward to in the coming year.